Book of the New Sun | The Cesspit. 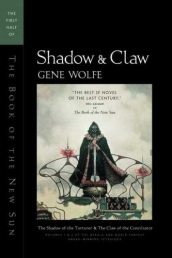 An Earth of the far future; a post-technological society living on the ruins of the past; ancient guilds with arcane rituals and origins lost in antiquity; cold and casual depictions of torture… Gene Wolfe describes all of these things in magnificent and luscious detail. Unfortunately, this takes up so much space that there isn’t room for a plot. On a forum recently I wrote that I’ve never been so close to the end of a book without having a clear opinion about it. In fact I could write two reviews, one full of praises and another as harsh criticism. I still don’t know whether I liked the book or not, but I can say I was intrigued. In a way the impression it made on me is a mix of Lovecraft and Gaiman’s Sandman. It’s nowhere a classic fantasy setting, or even a classic tale. It is… weird, shady, full of convoluted, self-referential symbolism. I could say that the book builds a barrier between the fictional world and the reader. Either you are able to pass it, and get sucked in, or you bounce back, and you’ll never understand what’s so special about it. I somewhat sat on that edge and took a peek at what’s beyond, but without really getting into it completely. That quote from the review is symbolically important exactly because it underlines a main trait, and what I expect to be a typical reaction to the book. It is baffling because you pass time reading with the hope to find… something. A development, or a direction that turns what you read before into something meaningful. You read and expect a build-up. Toward something. But you keep reading, and waiting, this something never arrives. You turn the last page and you wonder: so what? There’s no resolution. This is just a first book in a series, so you don’t even expect that kind of resolution, but at least you expect something, somewhere. A direction. A point. You expect a plot driven by something, but as that quote says, you keep reading and you don’t find anything. So is this book completely empty of meaning? Nope, on the contrary. But that meaning isn’t where you usually look for it. There’s no plot, no direction, no resolution. Characters are ghosts, the events are entirely disconnected and improbable, there’s no logic sense or flow whatsoever. Yet the book is full of meaning. It just isn’t where you are looking. It’s not in what is written, the black of the text. It’s instead in the white between the lines. The place where you don’t usually look for things. The content in the book will be only accessible if you got a key to decipher it. Many readers, with typical expectations, will glide over this kind of book and find nothing. They aren’t to blame as the writer surely didn’t care about them, and didn’t try to make his book accessible. In my case I fell in the first group, keep on reading with the hope of finding a key somewhere, then started reading forums and websites and finally got some clues about where to look. That’s the risk with this book, that you read it without knowing where to look, or expecting something that never arrives. So what is this all about? It is about the two levels. One is the surface, the denotative level. What things are explicitly. So the plot, what happens, the dialogues, the descriptions. And then there’s the symbolic level. What things represent. This book is filled with this kind of superstructure. It’s weighed by it and, in fact, it’s not an easy read. It’s terribly twisted, convoluted and alien. It is not simple because you have to move there and understand a way of thinking that may be so far from yours. Where the book becomes extraordinary is in its internal consistency. This book isn’t a tale. It represents instead the head of its narrator. It’s written in first person and it is the mind of Severian of the Torturers. In order to read it you have to enter his mind. And his mind doesn’t work as common minds. Everything you “see” is filtered through Severian eyes. You don’t see the world in its “correct” representation, but as personal interpretation. And here comes the main theme of the book: deception. The writer, the god of this world, making things as he wants, lies. So you have to look past this curtain. You have to look between the lines. From a side you have to understand the wicked mind of Severian, his twisted, paradoxical way of thinking, enter into it, from the other side you have to tear it apart to understand the blind point. Where he is lying. Where he is moving the pieces and for what kind of reason. This is why most of the book come as an enlightenment. As an epiphany. You read dumbly and somewhere you see glimpses of light. How often depends on your affinity with the writer, because as I said Gene Wolfe doesn’t really care whether you get it or not. He isn’t writing for you, he is writing for his kinds. It’s also no wonder that this book generated so much speculation. It lives past the text as what makes it unique is what beyond the text. Your own (and other readers) speculations. What makes interesting discuss the book instead of simply reading it as a direct experience. So you enjoy it with this kind of delay. Even in this case what makes it great is the internal consistency and hidden layers that make it deep and complex. That is typical of this kinds of “worlds”. That go past the medium itself. The mythos. This book generated its own mythos that survives the book itself and that is as deep as you decide to dig. You decide whether you want to lose yourself into it, or if this kind of commitment isn’t for you. Sure is that Wolfe requires a kind of total attention that no other entertainment medium requires today. It will remain in history as one of those things that less and less people manage to understand and love, but with an heart special and unrepeatable. A little gem that will be often mistaken as colored glass. I contributed with one slight speculation here. Ordered from bookdepository.co.uk (since it’s free delivery, and it’s convenient to buy single books) and arrived today. When I said I was going to read just the very best in the genre, I really meant it. Added points because I like long branching series and this is one of them. This is a nice edition from Tor, bundling the first two books. 410 pages in total, but written in a super-tiny character. I’m currently reading “Deadhouse Gates” by Steven Erikson, but the curiosity goes more toward Gene Wolfe since I’ve never read anything of him. Maybe I’ll try to read them in parallel, even if I prefer to focus on just one thing at time.